The H2O Power™ Waterboy is a funny and educational water powered thermometer. 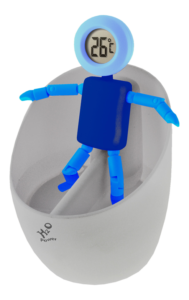 Simply add water into the ‘bath tub’ and the H2O™ water battery cells generates electricity. The waterboy thermometer can be attached to the bathtub with magnetic electrical connection points, which ensure the energy, generated in the ‘bath tub’ powers the thermometer display, which is integrated in the head of the waterboy.